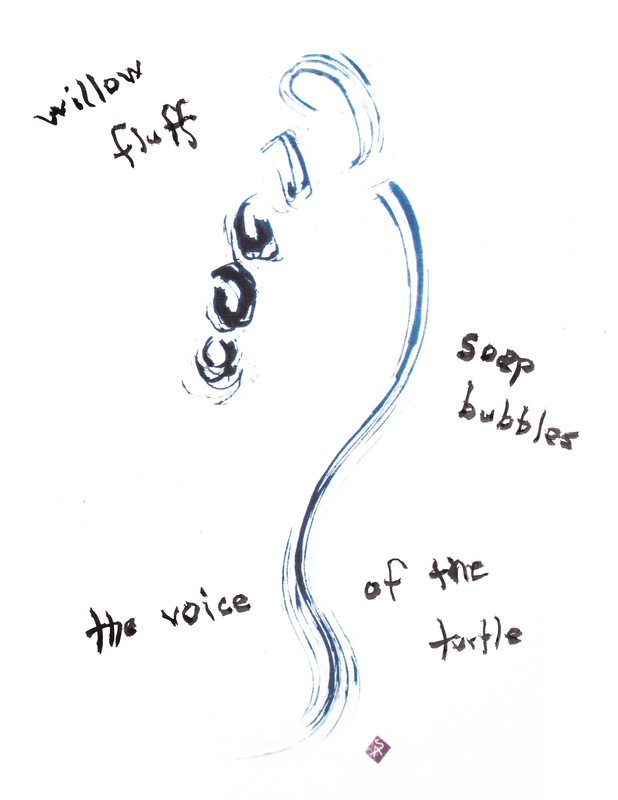 The haiga in this issue of Juxtapositions fall into two groups. The first show the influence of the Sino-Japanese ink-painting tradition, including the use of seals, although in all three cases the poet-artists add something of their own that makes their aesthetic Western as well as Eastern. 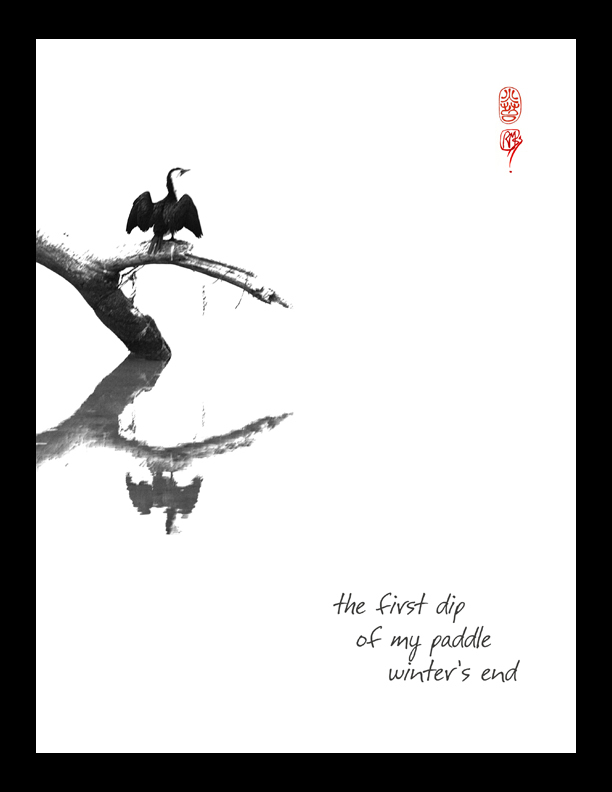 The haiga in this issue of Juxtapositions fall into two groups. The first show the influence of the Sino-Japanese ink-painting tradition, including the use of seals, although in all three cases the poet-artists add something of their own that makes their aesthetic Western as well as Eastern. The closest to the ink-painting tradition is “the first dip” by Ron C. Moss. He works with empty space, subtle ink-play, and no color — but wait — Chinese literati declared that one could summon up seven different colors merely by tones of ink. Here the lower reflection in lighter tones not only echoes the bird on a branch, but does so with a slight rippling that shows the poet-artist’s unobtrusive skill. The seal at the top, and the modestly-placed poem in the lower right are enough to keep the work multi-dimensional. 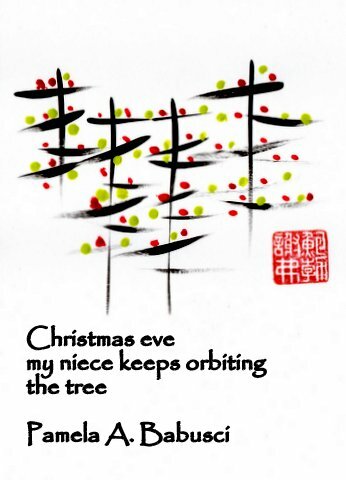 Although Pamela A. Babusci creates many haiga with only tones of ink, here she added color dots to rhythmic vertical and horizontal brushstrokes to represent decorated Christmas trees. We can enjoy the East Asian influence; the horizontals, in particular, resemble bamboo leaves. The dots animate the composition; they seem ready to roll off onto the ground, but perhaps the well-placed red seal orders them to keep them in place. By limiting her lines and colors, Babusci invites us to share the childlike wonder that animates her niece’s circumgyrations. Another form of rotation is shown in Ion Codrescu’s “first snow”. Here the multi-colored brushstrokes move the tea bowl around in our hands, giving us a three-dimensional experience in two dimensions. This solves the old problem of how to depict round tea bowls in flat paintings or photographs. 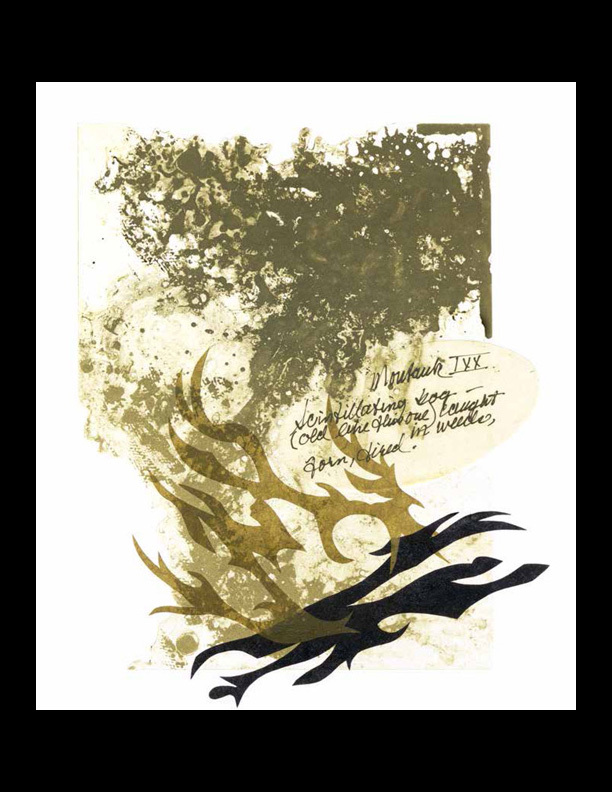 And by allowing the calligraphy of the poem to interact with the movement of the painting, Codrescu lets us experience the moment even more fully. 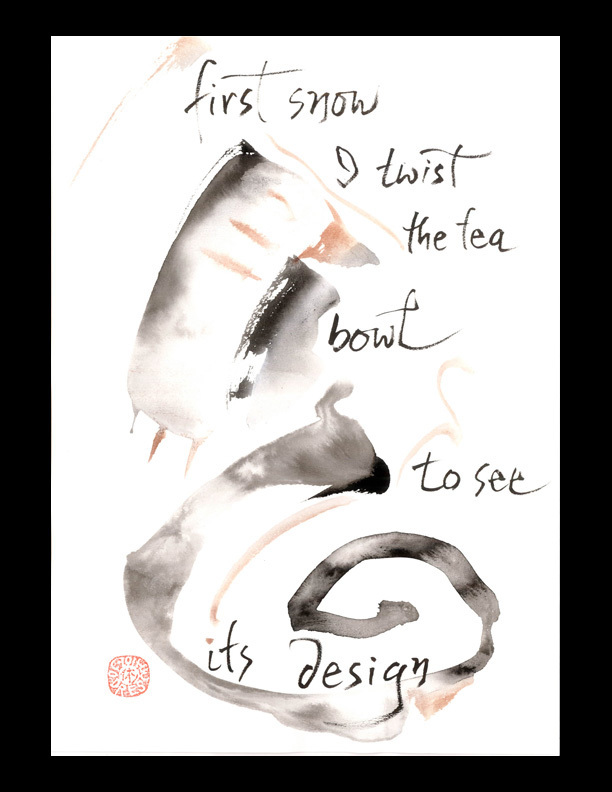 The three haiga in the second group are more abstract, coming from a modernist or post-modernist background, and they each have a different kind of three-dimensionality, more akin to collage. For example, Ellen Peckham uses two basic forms and two colors overlaid on each other. Two active sharply defined black forms dart over the bottom of the softer golden background, and then three similarly sharp golden forms thrust over the black. The result is a sense of active energy, as though the golden forms were chasing and biting the black ones. Terri French also offers us at least three layers, or (like Peckham) four if you count the calligraphy as a layer. 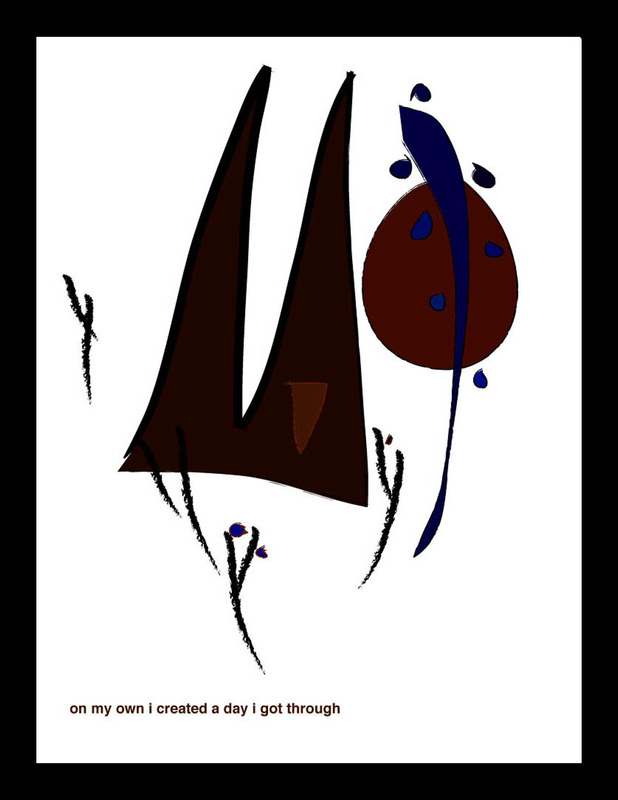 Her haiku adds a marvellously ambiguous element — yes, we can see one leaf partially over a blue layer, and there is a tree as well in a different scale: the leaf is larger than the tree from which it may have come, and exists in a differently hued world. 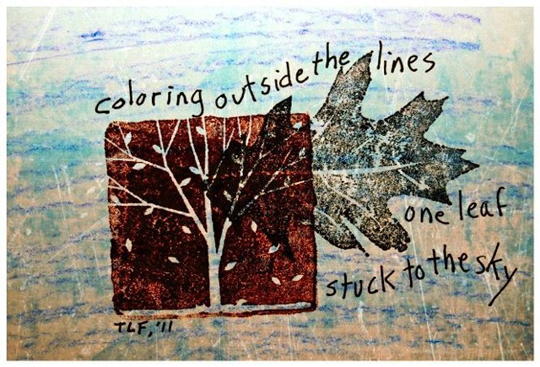 So who or what is coloring outside the lines? The artist? The leaf? The viewer? Above all, we should not get stuck on a single interpretation.